His name was Giuseppe Melchiorre Sarto, born June 2, 1835, in the farming village of Riese, Italy near Venice. The oldest boy in a family of nine children, his family called him “Bepi.” We know him better today as Pope Saint Pius X. His family was poor. His father, Giovanni, was a mailman and died before Giuseppe became a priest. His mother, Margarita, was a dressmaker (interestingly, the root word of Sarto means “tailor”) and lived to see her son inaugurated as Cardinal of Venice. Two of his sisters became religious nuns and served him later in the Archdiocese of Venice. Young Bepi was first in his class in grammar school. At the age of 11, he told his father that he wanted to be a priest. His father sought the help of the local parish priest to send Giuseppe to a prominent catholic high school some six miles out side of town. At the age of 15, Bepi graduated first in his high school class. Per the custom, Bepi immediately entered seminary in Padua to learn the priesthood and test his vocation. Again, he graduated first in his class and in 1858, at the age of 23, he was ordained a priest and Don (father) Sarto was assigned assistant pastor in the farming village of Tombolo. With the help of his pastor, Don Sarto fostered three important gifts: devotion to the Eucharist, the joy of preaching and love for young people. His masses were reverent; his sermons were thoughtful and touching; and as the oldest boy from a large family, he enjoyed the poor youth of his parish for they reminded him of home. At Tombolo, he began an after school program to help children learn more about the faith and develop their skills in reading and writing. The classes became so popular that Don Sarto expanded to a night school for adults. 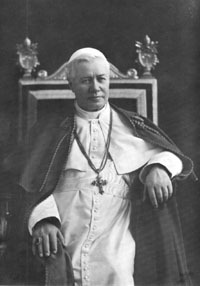 Some church historians credit Pius X with developing the foundations of modern catechism and adult education still held in parishes today. Don Sarto stayed at Tombolo for nine years. At the age of 32, Don Sarto was appointed pastor of Salzano where he remained for another nine years until 1876. Pastor Sarto became prominent for helping poor farmers and cattle ranchers of the area. He funded schools and supported the local hospital when an epidemic of cholera impacted his parishioners. Many people noted the pastor rarely slept and nicknamed him Perpetuum Mobile – a machine in perpetual motion. Recognizing the talent and energy of the young priest, the Bishop of Treviso named Don Sarto a Monsignor and promoted him to important positions as spritual director of the local seminary and chancellor of the Diocese. In Treviso, Monsignor Sarto was in his element – teaching, preaching and administering. He became known for his quick wit and humility. More importantly, the Cardinal saw a man who loved people and destined for leadership. At the age of 51, another nine-year period, he was named Bishop of Mantua. Monsignor Sarto protested his elevation to Bishop. He did not want to leave the seminary. He even wrote to the Vatican and requested reconsideration. The Vatican sent a one word reply from the Pope – “obey!” Bishop Sarto was elevated on November 10, 1884. As Bishop, he cultivated educated and spirit filled priests. He adopted the teaching methodologies of Saint Thomas Aquinas for seminarians and instituted the Gregorian Chant for mass. Soon, parishes in Mantua were experiencing spirit-filled masses with good preaching. In six short years, the troubled Diocese of Mantua was turned into a vibrant jewel of the Church. On June 12, 1893, Pope Leo XIII elevated Giuseppe Sarto to Cardinal of Venice. At news of his appointment, Cardinal Sarto told the local newspaper that he was “anxious, terrified and humiliated.” His first act was to return to his hometown of Riese where he celebrated mass for his aging mother, his family and friends. His mother passed away soon after he left for Venice. During his days as Cardinal, Giuseppe continued to promote more educated priests, enhanced catholic schools and raised money for the sick. Pope Leo XIII died on August 4, 1903, Cardinal Sarto was reluctantly named Pope after only a four-day conclave, by a margin of 55 out of a possible 60 votes. The humble farm boy told his fellow Cardinals that his name would be Pius. “As I shall suffer, I shall take the name of those Popes who also suffered.” His coronation took place on the following Sunday, August 9, 1903. In the Vatican, the Pope made changes that impressed some and irritated others. He wanted to be a less formal and more approachable Pope. Each evening, he invited other priests and workers in the Vatican to dinner. To the chagrin of the Swiss guards, Pius X would often escape the Vatican walls through garden passageways unescorted and visit the sick in local hospitals. Not surprisingly, his Papacy was marked by improving priestly formation, instituting better liturgy and music, and requiring quality preaching from priests and bishops. Always an educator, he modernized Canon law and introduced progressive scholarship through the biblical institute of Rome under the Jesuits. In 1905, he lowered the age of receiving the Eucharist for young people, still in effect today (around 7 years old). He fought against a theological teaching known as “modernism” that Pius X felt was a form of heresy and atheism. In his latter years, he preached strongly against war and violence. Pius X had vivid dreams and visions that a great war would break out in Europe in 1914 killing many innocents. His visions were about World War I and they were accurate. Pius X would not live to see the long-term effects of the disaster but his prophesies were chilling reminders after his death. During his tenure, the Pope supported European immigrants who fled to North and South America. He formed many new Dioceses and appointed new bishops in the Americas. In the last year of his life, Pius X held many private audiences with the poor and sick. It was during there private visits with common people that rumors of miraculous cures began to spread throughout Rome. Among those cured through his prayers were two religious sisters who confirmed the healings after his death and promoted his canonization to sainthood.